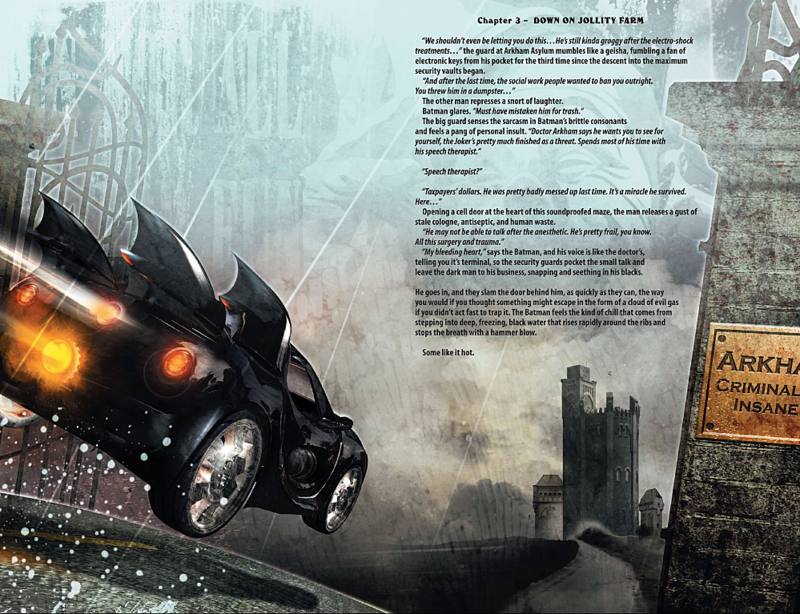 Batman #663 is 22 pages of words and pictures --- the former courtesy of Grant Morrison, just a few issues into his landmark run on the title, the latter by digital artist John Van Fleet --- but the two elements are mixed into something that's closer to an illustrated storybook. Look at any given page, and you'll be faced with as many words as an average issue of traditional comics, interspersed with Van Fleet's posed CG characters resembling a gritty reimagining of '90s animated series ReBoot. I know some people, catching up on the run in trades, who glanced at this chapter and just skipped straight past it. 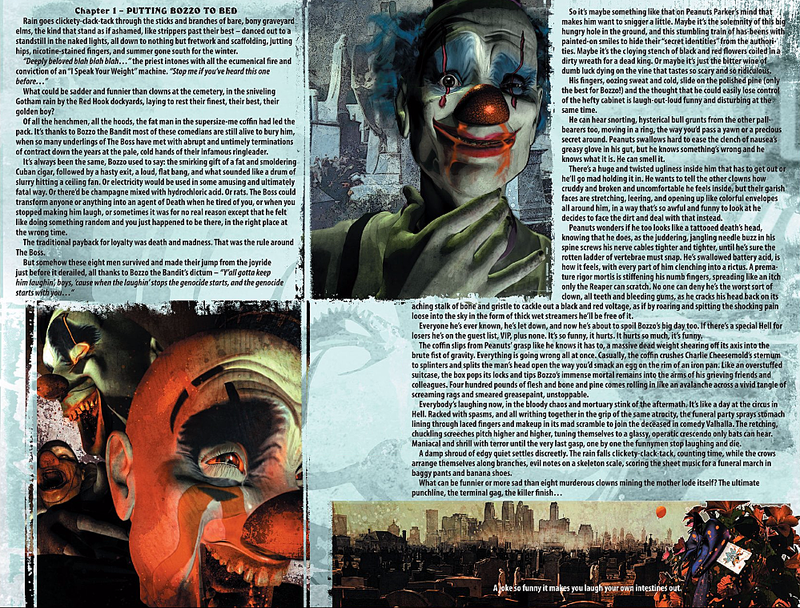 So why does “The Clown at Midnight” --- to give the issue its full title --- abandon the comics form so completely? Well, the clue's in the name. Comics, by their nature, are kind of an orderly artform. Serial comics especially are constructed from a scale of restrictive units: issues, pages, panels. An ever-shrinking set of boxes to trap the story in. But Batman #663 is a Joker story, about the clown prince of crime's reinvention after taking a bullet in the face --- and the Joker, especially as portrayed by Morrison, is not too keen on inside-the-box thinking. Hence: prose, which is a much messier form of expression. Sentences can be any length, running for pages or consisting of a single word, and here it's used to let us sample the chaos inside the character's mind. That's an effect both artist and writer steer into, hard. Van Fleet's art constantly strains to break out of the restraints it's been given, blurring the edges of boxes so they look like a Papa Roach album cover, or even flopping out onto the rest of the page to disrupt the reading flow of the text. Morrison embraces his inner pulp-fiction writer practically to the point of strangulation; strings of adjective and simile tumbling out onto the page like he's not fully in control of the keyboard. The result is actually quite ugly, with a visual style evoking the manual for a bargain-bin videogame, and writing that crushes just about every convention of 'respectable' literature like a crook's windpipe under the weighty tread of a Bat-boot. Calling this prose 'purple' doesn't begin to cover it. No line of dialogue is simply "said" when it can be “barked” or “cackled” or, in one memorable instance, “mumbled like a geisha.” Similes are stretched thin over multiple sentences, so they sag like collapsed plastic surgery (that's not a line from the comic, but it could be). Something is even described as “cruddy” at one point, which frankly is about as ugly as language gets. There are moments of beauty that poke through, though. There's the odd bit of pure pulp excellence (“a single punch that turns cartilage to shrapnel”) and Morrison's descriptions of Gotham (“a party ten miles long and six miles long”, “the kind of town that whispers 'baby' while it's picking your pockets”, “where grimy clouds snag and burst on the vicious needle points of world-famous Deco-Industrial superscrapers”) are evocative as hell. You probably don't need a phobia for those leering melting-plastic clown faces to experience a shudder. We open with a funeral for one of the Joker's henchmen that inevitably ends in messy tragedy, setting the tone for the rest of the issue. This is the absolute darkest, dirtiest, grim-'n'-grittiest version of Batman. That's not the DCU I always want to see (sorry, Batman v Superman) but for a story told from the perspective of the Joker, it actually makes perfect sense. “Life and death formed into one more ugly, unfunny gag,” to steal a line from the issue that pretty much nails its own aesthetic. That doesn't necessarily make for enjoyable reading, though, and the story only really comes to life when taken in context. Coming near the beginning of Morrison's 70-issue run, the style of “The Clown at Midnight” already rubs uncomfortably against the handful of issues that precede it, which featured Batman fighting ninja were-bats in a museum full of technicolor pop art. Batman #656. Art: Andy Kubert. In the contrast between those two styles, you'll find the single best idea in Morrison's entire run: that every Batman story counts. Which brings us to the messy climax of this issue: the Joker's rebirth. These pages read like an unedited pitch document for an overhaul of the character, like something written with bleary eyes, an ungodly dose of caffeine, and no backspace key. Van Fleet matches that energy with his best work of the issue. Shadows blend into the background of the page, a gleaming scalpel threatens to break free of the page, a close-up of our new Joker squats right in the middle of the uncanny valley. 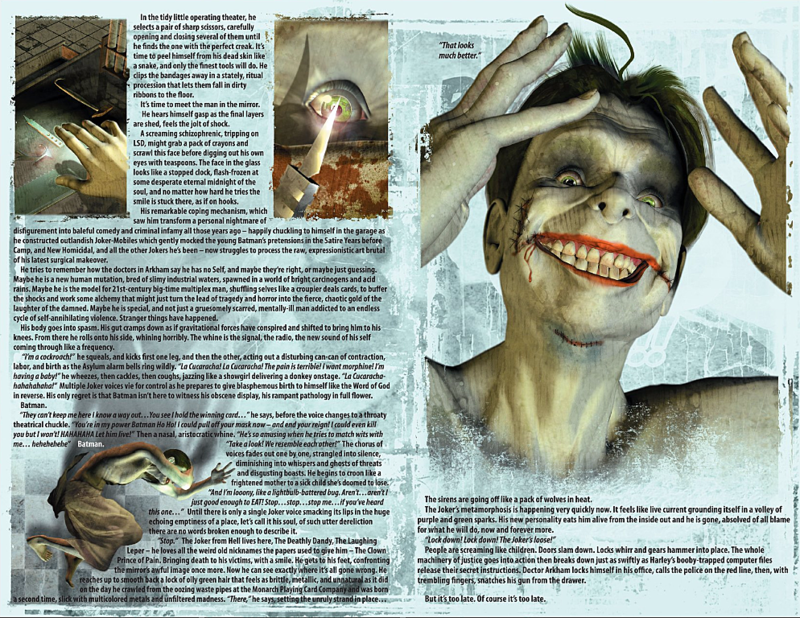 The scene manages to tie together Alan Moore's take on the character in The Killing Joke with Morrison's own diagnosis, in Arkham Asylum, of the Joker's “super-sanity.” It presents the Joker's ever-changing personality as a coping mechanism, a reaction to the one bad day that Moore and Brian Bolland put him through, the blackest possible extrapolation of the idea that, well, you've got to laugh, haven't you? It's order and chaos --- an exposure to what it's like inside the head of the world's most evil man and an explanation for why his head like that in the first place --- side by side. Co-existing like Batman and Joker, like Christian Bale and Adam West, like words and pictures. It's the juxtaposition that defines more or less the entirety of Morrison's seven years writing Batman and it's all here, just fives issues into the run, in "The Clown At Midnight".